The Arkansas Pharmacy Foundation (APF) is a 501(c)(3) that was created to promote the profession of pharmacy in Arkansas through continuing education and by providing scholarships to outstanding students. The Board of the Foundation is composed of all living past presidents of the Arkansas Pharmacists Association. The APF board meets annually. Click here to view all APA past presidents. The APF hosts an annual Scholarship Golf Tournament to raise money for the Charles M. West Student Leadership Award. The 2015 Tournament will be held April 16 at the Tannenbaum Golf Course in Drasco. Click here to learn more about the Scholarship Golf Tournament. 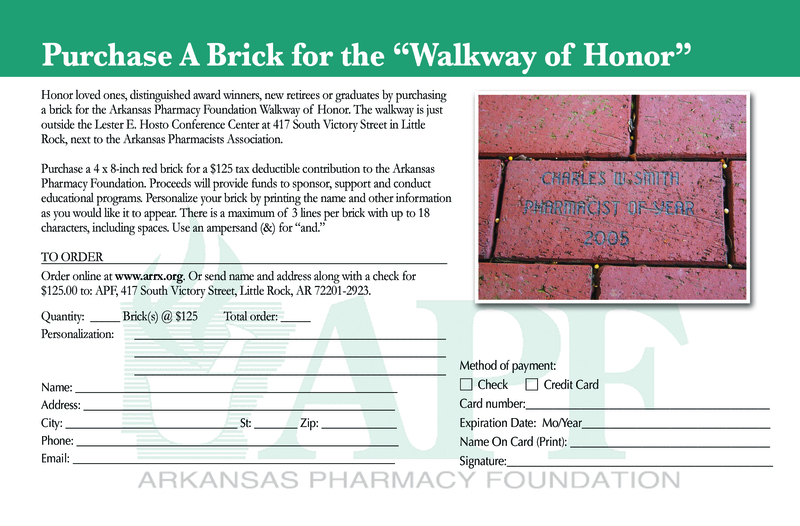 The Walkway of Honor is an opportunity to honor or memorialize a pharmacist colleague. Click here to learn more about the Walkway of Honor . 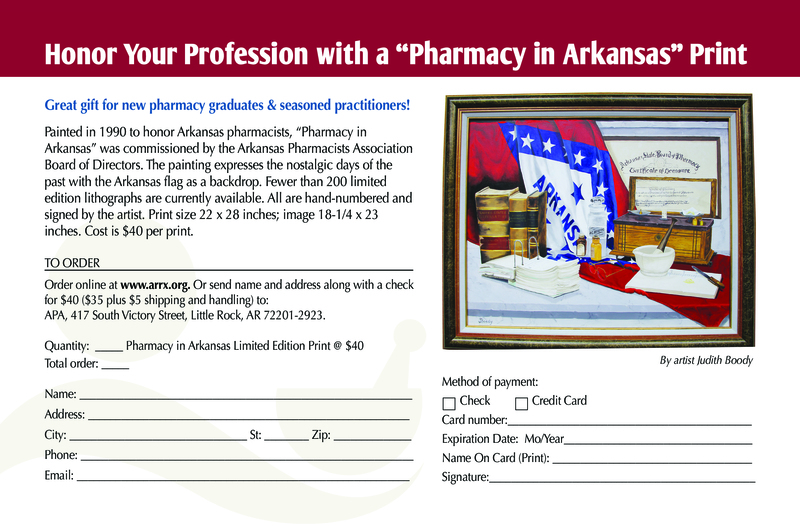 Painted in 1990 to honor Arkansas pharmacists, "Pharmacy in Arkansas" was commissioned by the Arkansas Pharmacists Association and painted by Judith Boody. The painting expresses the nostalgic days of the past with the Arkansas flag as a backdrop. Fewer than 100 limited edition lithographs are currently available. All are hand-numbered and signed by the artist. Print size is 22 x 28 inches; image 18-1/4 x 23 inches. Cost is $40 per print. Click here to order a Pharmacy in Arkansas Print.